A couple of days ago, my hosts Buriganga Waterkeeper Sharif Jamil and his wife Mithun took me on a drive across Bangladesh to the Satchori National Forest near the Indian Border where we were accompanied on a short hike by Mr. Mahmud Hosen, a ranger there. There we were met by Waterkeeper Tofazzal Sohel and his friend the poet Sifur Rahman Kayes. Satchori is a 600-acre forest with seven streams and over 200 species of trees, as well as many species of butterflies, brids, and animals. It is exceptionally lush during the monsoon season. Our visit was over a month before the start of the moonsoons, and though the stream I saw was totally dried up it was still very verdant compared with all the dust-caked trees closer to Dhaka. This are is where Sharif and Tofazzal grew up. Sharif said that when he was younger it was teaming with so many trees, you couldn't see the sky except on the roadway. 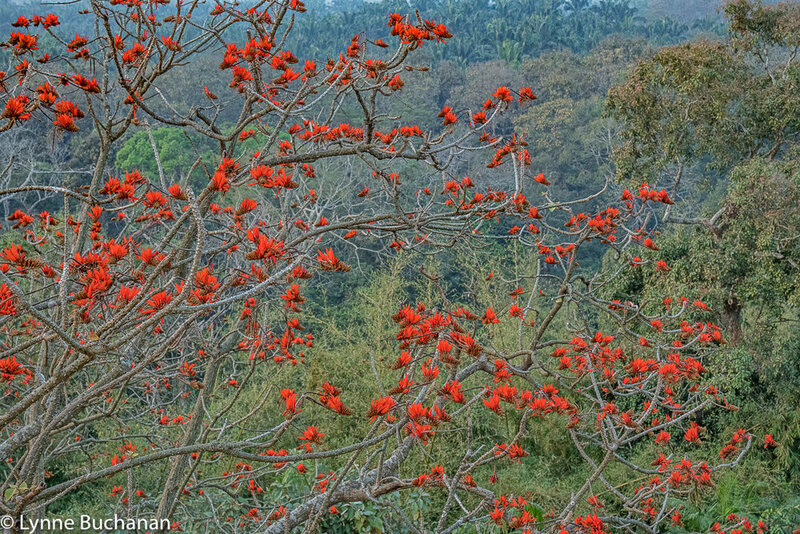 Climate change and air pollution have put a strain on all vegetation in Bangladesh. Still, I was very happy to be in a natural area with green trees and very healthy looking bamboo. Hopefully, the environment will be preserved in Bangladesh, so that one day I can return and hike more of the trails here and in the country's other rain forests. This is one of the streams flowing through the park. Moonsoon season does not begin for more than a month, so there was no water. The image above shows all the biodiversity of the trees. I have never seen such a tall bamboo with such a full crown of leaves. Some of our party beginning the ascent to the tower. Here we all are at the summit of the tower. I am standing between Mr. Hosen, the ranger, and Mithun. Next to her is Tofazzal and beside him is his poet friend Sifur Rahman It was such a special time sharing the beauty of this wonderful area with my new friends who are committed to preserving the environment of their native country.